When you're in the Southport area and want to do some serious fishing with people who know where the fish are hanging out, try out one of the Southport fishing charters. At Oak Island Fishing Charters we specialize in nearshore, offshore and backwater fishing trips. You can be assured our captains are fully experienced in guiding you to where the fish are and navigating safely. Our boats set sail nearly every day and we look forward to having you join us on one of our ventures! Our Southport fishing charters will take you as far out into the deep blue waters of the Atlantic Ocean as you're comfortable with. The type of fish you'll have access to changes as the water gets deeper. Just beyond Southport are gorgeous Mahi-Mahi, Wahoo, King Mackerel, Grouper and Snapper. 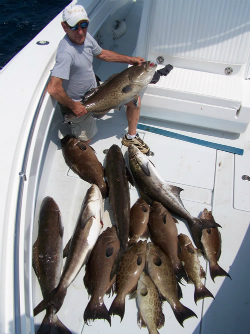 As you continue further out to the deeper water you will discover Big Amber Jack, Grouper, African Pompano and Cobia. A maximum of six people are allowed on our 30-foot Contender, making your offshore trip a comfortable yet powerful one. If you want to stay in the waters near the shore, that works too as we board the 19-foot Palm Beach boat to trek the waters for a wider range of species of fish which include, but are not limited to Bluefish, Flounder, King Mackerel, Spanish Mackerel and Sharks. Up to six people can take part in this nearshore fishing trip on the Palm Beach boat. At Oak Island Fishing Charters, it's all about appreciating environment that sounds us. We look forward to having you enjoy it with us - whether for a half or full day of fishing -- so grab your rod and get ready to throw out a line as we sail the depths of the Atlantic. Reserve a charter fishing boat today by calling us at 910-470-1995.